SAND CASTLE OR SOLID ROCK RELATIONSHIP? Sometime ago,I decided to spend the weekend in my good friend’s house. We’ve been friends since early Uni days. I met her younger sister back then and we also became friends although she’s a little younger. Wande is in her final year and she’s a very nice person. I was doing the dishes in the kitchen one afternoon, when she walked in. “I have a date,Sis” Wande said. ‘Really? That’s nice’ I replied turning back to look at her. ‘You haven’t gisted me about this guy yet’ I added. ‘When I get back’, Wande replied, weaving the tip of her long Brazilian hair. She has grown to become a very beautiful young lady, I thought. Wande came back at about 6:45pm that evening. I was gisting with her elder sister, my friend when she walked in with a paper bag of cosmetics. She just sat on the bed and started dishing out the gist in full. She told me about the guy she had been with since her 2nd year in Uni. He’s a working class guy and he’s quite older than she is. From all she said, I could tell the guy was really into her, and I could also picture the level of interest Wande had in him. Without hesitation, she gave out a loud laugh and said ‘NO!! !’ I wasn’t too surprised; I could predict that from the way she spoke of him. I asked her why and she told me the guy was very cute and nice but that she can’t marry him. With that, I said no further. I just kept mute watching her expressions as she answered further questions from her elder sister, my friend. I remember a friend of mine back then in school. He was a lot older but we were good friends. He had this lady (his age bracket) who he was dating. She was a working class babe while he was in school. The lady obviously loved him and he also appeared to be so much in love with her. One day, we were discussing marriage and I teased him saying, ‘Shebi you don get wife na’ He looked at me and smiled. ‘I can’t marry that Chic jare although she’s an amazing young lady. I just can’t’. I was really surprised by his own response because he appeared to be sooooo in love with that lady. Of course he had reasons, but I’m sure the lady had no idea that he thought in that way. This led me to think of Sand castles. When building a sand castle, you are very much dedicated to it and once you finish building it, you stay there to admire it. 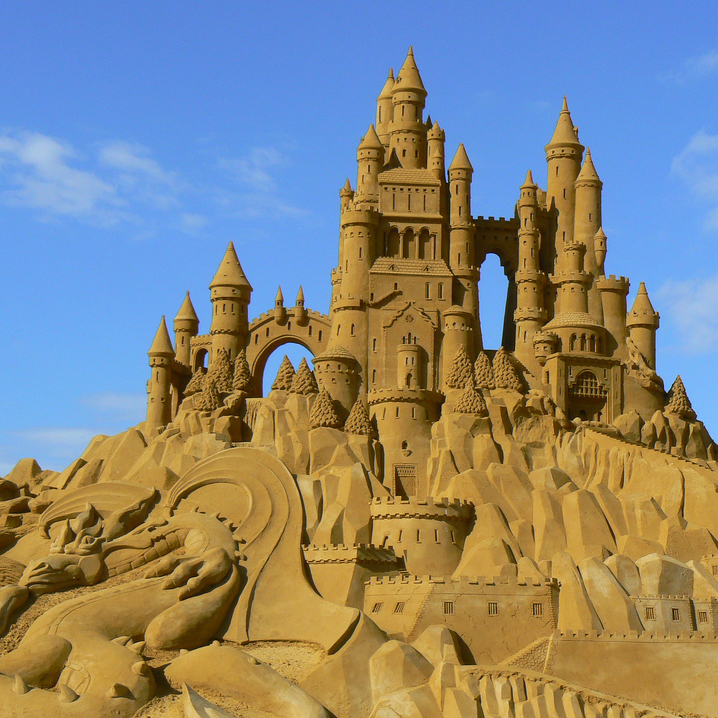 But when the tide comes or the sea flows to the shore, the sand castle might get washed away. That’s how it feels like being in a relationship you think is really serious whereas your significant other only sees you as an ephemeral material. Personally, I’ve seen sand castles being built and washed away. A good number of us have found ourselves in relationships where we took the other person as our only choice, only to find out we were just an option. So many people are into serious relationships with people they know they can’t marry yet they keep leading them on. Really, I think it’s unfair to treat someone that way. that the person they are dating won’t marry them yet they still stay in such a relationship saying ‘let’s just continue for the time being’. To me, there is nothing worse than looking back and realizing how much time you’ve wasted, climbing the wrong ladder rightly. If you don’t see yourself spending forever with a person, there is no point wasting your time and the person’s time by investing so much time and energy in such a relationship. By doing so you’ll end up hurting the person much more. Why not let them go and find their happy place? Hi guys wat up to day. let us all remember that hurting people hurt others.See what you have to trade with before you sold out ,instead of playing on peoples emotions.there are better ways to handle things with a lady/guy you never wanna let go.you can still keep people as your best associate instead of hurting them.I think sometimes the wrong person loves right and we get confuse on this. U are ryt bMan when ever you have a very good friend, before u asks her/he to go into a relationship pls take your time and think if that person will be good as a friend or a lover. I have some friend which ‘I and them’ CAN never go in to relationship with “I know that and there know that” and we are happy that way. i am a guy and in the place i work their is this gorgeous girl that i am friend with but i can go into relationship with for some personal reasons. but we are still happay the way we are. You are well correct, and i think that sound like a player to me . the best tin is dont go for relationship if ur heart is not in it.